This trophy is for unlocking everything in the central chamber of Ivaldi's Workshop in Niflheim. This is a long grind. For the sake of things, I will give a broad overview on how to get this trophy. Once you have the ciphers, you can travel to that realm. Niflheim is covered in a poisonous mist that will deplete a pink bar when you've entered an area with it. If the bar depletes completely, you will rapidly lose health, so make sure you keep an eye on it. Once you arrive, you will meet up with Sindri who will tell you a bit about the area beyond his shop. He tells you about some armor that he can craft for you to help you through this poisonous maze, but first, you need to collect 500 Mist Echoes in order for him to craft you a keystone to enter Ivaldi's Workshop. Each time you enter the maze, each 'area' will randomly generate a set of enemies, ranging from standard Draugr to Dark Elves, Wulvers or even Travelers, so be prepared. The area's between the main areas (A/B/C/D), will have a set of randomly generated traps. The traps range from closing walls to moving saw blades. You cannot memorize the traps because they will change each time you leave and come back in. To get your first 500 Mist Echoes, enter area D from the entrance. You will most likely be able to get the 500 you need in this first area. Defeat the enemies and open the chests. If you do not get 500 in here, my suggestion would be to move through the traps to the left, towards area A. Once you have your 500 Mist Echoes, return to Sindri, turn in the quest and craft your keystone at his shop. 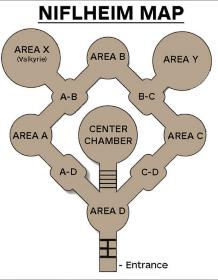 Once you have the keystone, enter back into the maze and defeat the enemies in area D once again, then enter the center chamber with the keystone. Inside you will find a multitude of chests along with three Realm Tears. Some of the chests in here can already be open, while five of them are locked and require a different amount of Mist Echoes per chest. You will need a total of 23,500 Mist Echoes to open all of the chests. You can open the chests in any order you want so long as you have the correct amount of Mist Echoes. One of the free chests in here will have the rusted armor that Sindri requested. Bring this back to him (while defeating the enemies in area D), to complete Sindri's second favor. Sindri's last favor and the last part of completing this trophy, is to seal the three Realm Tears in the central chamber. You need 45,000 Mist Echoes and 3 Anchor of Fog to complete the Tears. The Mist Echoes will be collected by making your way through the maze. The Anchor's of Fog are random drops in the legendary gold chests in the maze. They're random, but there is a super easy way to ensure you get them. Starting at area D, you can go right or left, but for the sake of things, I went left towards Area A. NOTE: There will be times when a Nornir chest will randomly generate at the entrance of Area D. The three runes to open it are located in A, B, and C. You will need to memorize (or take a picture) of the runes to remember them later. You will find a spinning pedestal in each main area. Throw your axe to hit it to the correct rune before you move on. There are also small areas between each main area (D-A/A-B/B-C/D-C). At least one Nornir chest will spawn into one of these three areas per run. There are bells located on the cliffs above to unlock this. If nothing else, make sure that you unlock these as they provide the most Mist Echoes. Enter area D, defeat the enemies and move toward Area A and repeat the process. At the A-B point, is a left path that you can take to Area X which contains the Valkyrie Hildr. She is not very hard and I highly suggest going in and taking her down as soon as possible. This is where the Anchor's of Fog become less random. Area X and Area Y will now randomly generate enemies after defeating the Valkyrie. These enemies may be Travelers, but will most likely just be the same enemies as the other areas. After defeating enemies in these areas, you will find a gold legendary chest. Every time I ever went into these areas, I received an Anchor of Fog from those chests. Continue to make your way around the maze, making sure to hit Area Y as well. Once back to Area D, return to Sindri to bank your Echoes. If you die in the maze, any and all items collected will be lost, so make sure to bank your items after each run. I averaged anywhere between 6,000-8,000 Mist Echoes per run, depending on how far into the maze I went. Doing this 10-12 times will bank you enough Mist Echoes and Anchor's to open all chests and Realm Tears. Now, to the last part of this trophy. Once you have your 68,500 Mist Echoes and 3 Anchor's of Fog, enter the central chamber. Feel free to unlock all of your chests. The last part of this is to seal each Realm Tear. After defeating all of the enemies and permanently sealing the Realm Tears will unlock this trophy! There are currently no gaming sessions for the Darkness and Fog trophies that you can join - why not register and make a new session?